Contact us for an application form. Please return your completed application form with a deposit of £60 to secure your place. The balance of £135 is due by Mon 23 July. 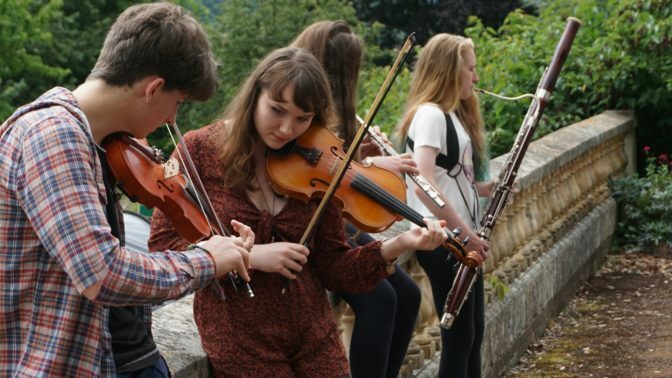 Now in its second year, Halsway Young Folk – Advanced is an opportunity for musicians and singers aged 16-25 to explore and develop their skills in arrangement, composition and ensemble work. Collaborating with a variety of instrumentalists and vocalists, you will each have the chance to musically direct a group of performers to explore tunes and songs of your finding and choosing (we have the second largest library of printed and recorded folk resources in the country). You will explore formal and and more organic arrangement styles, extended composition techniques and experiment with framing folk repertoire in traditional and modern musical settings. Each piece will be professionally filmed for you to use as promotion of your work or just to show your friends and family! The course will be led by Will Lang and Niopha Keegan. Both Niopha and Will enjoy wide and varied careers as composer/arrangers with their works performed by National Youth Choir of Great Britain, Liverpool Philharmonic Orchestra, Charles Hazlewood’s Chamber Orchestra and Young Voices, in venues including The Royal Albert Hall, Glastonbury Festival’s Pyramid stage and Durham Cathedral. For a full playlist of Halsway Young Folk Advanced 2018 end of course videos click here.